One of the most delightful and informative ways beeks can advance their understanding of bees and beekeeping is by attending conferences. The American Beekeeping Federation conference was held in Anaheim this year in January and I went to several presentations. This was a completely academic conference, combined with a large trade show—no live bees to work with. This group also reflects a strong conventional management and commercial pollinator representation. There are always things to be learned though, and I found the time well spent. However, a number of smaller and more appropriate conferences for us treatment free folk also occur every year. The 8th Annual Organic Beekeeping conference at Oracle AZ, put on by Dee Lusby allows participants to visit the 9 bee yards kept by Dee in the remote Sonora desert near the Mexican border. These bees are never moved (no migratory pollination) are at least 4 deeps tall, are not re-queened or supported with any feeds, and are visited (on average) just 5 times a year. Dee’s honey is very dry and dark, reflecting the dry climate and mixed desert flora the bees have for forage. These flowers include many desert shrubs, cactus, wildflowers, and introduced weed species too numerous to mention. The Spring rains this year have been abundant and well spaced, so we saw lots of wildflower and cactus blooms. The desert smelled wonderful—fresh, sage-y scented with alternating bright blue skies and looming smokey thunderclouds. Rob McFarland (Co-Founder of HoneyLove) and I drove to Oracle, which is in a very remote area. The conference is sited at the YMCA, with cabins and bunk beds for sleeping and 3 full cafeteria meals a day. Some of the best time is spent at meals in talking with other bee keepers from all over the US and even other parts of the world. The conference lasts 3 days, with speakers on a range of subjects—apitherapy (using bee stings for health reasons), introduction of a new national on-line register for swarm calls to beekeepers, the beekeeping management calendar year from a extreme climate perspective, and new information on genetics and breeding of queens. Michael Bush and Sam Comfort, our great friends in treatment free beekeeping not only spoke individually, but on the last night gave us a melodious, heartfelt performance for almost a hour. Michael plays guitar and sings, Sam plays ukelele and banjo and a MEAN harmonica!! It was stupendous and had people’s roaring approval. Our final day was devoted to driving on dirt roads to Dee’s remote beeyards—she has 700 hives. The day was a bit windy and cold, with threatening rain, but we went anyway, and the desert was glorious with color. The desert bees were very ferocious in defending their colonies, reflecting the weather and forage conditions they must deal with. We were fully suited and gloved to help restore some hives that were tipping wildly from the undermining of the bottom board by tunneling rodents. The hives had to be totally unstacked, the bottom board leveled and supported by fresh soil and the hives re-stacked—each at least 4 deeps. I urge all that wish to really know beekeeping and infuse the relationship with new knowledge to attend these bee conferences. 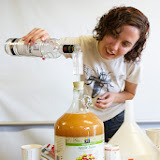 Thanks so much to everyone who came out to HoneyLove’s Hard Apple Cider Workshop last weekend! Click below to view some photos from the workshop! Click here to download the workshop handout via dropbox! If you are interested in the mysterious task of rearing queens perhaps you would like to join Les Crowder and OneStrongHive for a TWO DAY WORKSHOP! We will do some first hand queen cup making, grafting and all that bringing these precious gals into being entails. This will be a two day workshop on Saturday and Sunday the 8th and 9th of March, from 10:00 AM – 4:30 PM each day. The price for the 2 day workshop is $130 and it will take place in Silver Lake, California. Payment can be made in advance with PayPal (payments to: oramomi@gmail.com) or you can pay with cash or check at the workshop in person. CLICK BELOW TO SUBSCRIBE TO OUR MONTHLY NEWSLETTER! Dr. Roberta Kato, a longtime Bee Rescuer in Los Angeles, Master Gardener, Chicken-keeper and all-around great human being, spoke at the Advanced Beekeeper meeting on November 24 at HoneyLove HQ. Her topic was “Making the World Better, One Beekeeper at a Time,” and Roberta walks the walk. She recommends volunteering, paying it forward, building good karma (no matter what your beliefs are), inspiring others and developing altruism. Her suggested methods for achieving this are doing rescues, mentoring, talking to schools and classes, garden clubs and the public (email volunteer@honeylove.org to get involved with outreach!). Her last suggested method is to be a little unapologetically eccentric. Roberta told the group how she got started doing bee rescues, how it quickly grew out of hand and what she learned by “diving in.” It wasn’t long before she found herself picking up swarms and doing cutouts at 5a.m. before work and in the evenings after a long day. Working at night was how Roberta first learned that bees crawl when it’s dark. Climbing 25-foot ladders never helped her get over her fear of heights but it saved dozens of swarms. So why does she still do it, with gardening and chickens and dogs and rabbits and pediatric pulmonary research to keep her busy? Because she doesn’t want other new beekeepers to make the same mistakes she did, to help reduce the number of times chemicals are used to exterminate a colony, to deepen her appreciation of nature and to make feral bees and beekeeping not such a big deal. There was a time when having a hive in one’s yard was not uncommon. And while it’s satisfying to introduce hundreds of new people to bees and beekeeping, a mentor also has to understand when to say “No.” Roberta had to turn away more than one overly enthusiastic rogue beekeeper in tulle and crew socks. Many thanks to Roberta Kato for taking the time to come speak with us, for the hundreds of rescues she’s performed and for making the world a much better place. HOW TO BE A BETTER BEEKEEPER. These events are taking place at the same time as the erstwhile Backwards Beekeeper meetings, at 11a.m. on the last Sunday of the month. The forum is to have our experienced treatment-free beekeeper community teach each other what we’ve learned so far. New beekeeper meetings are held on the 2nd Saturday of each month and feature Chief Mentor KirkoBeeo. Everyone is welcome at any meeting and those with bee fever should attend both. The new Advanced Beekeeper meetings began at HoneyLove on October 27. Held on the last Sunday of each month at 11am at the HoneyLove office, these meetings will fill the gap left by the Backwards Beekeepers and will help advance the learning of the L.A. treatment-free community. Each meeting will have a member-speaker teaching us all something new as well as a general open Q&A and mentorship opportunities. Beekeepers of all levels are welcome to attend; HoneyLove also has more introductory-level beekeeper meetings on the 2nd Saturday of each month. Attendees are encouraged to join HoneyLove.org for extra benefits and the tax-deductible donation. The October speaker was Josip Benko, a second-generation beekeeper with over 30 years of experience. Josip is from the former Czechoslovakia and shares the philosophy of observing the bees because they’ll show you what they need. He is also big on experimentation and customizing his hive boxes. Josip brought several hive box samples; these are reduced for education purposes. He now uses 7 or 9 frame boxes because his observation is that bees don’t like even numbers. View more photos from the event here! RESULTS from HoneyLove 3rd Annual Honey Tasting!